All eyes will be on this week's monthly labor report. The report, which is due Friday at 8:30 am ET, may impact the outcome of the Fed's December meeting. Friday's non-farm payrolls report will also impact how the major indexes act near areas of possible resistance. Use this link to see a larger version of the chart below as of Monday's close. Is The Bigger Picture Starting To Favor Lower Lows? This week's stock market video looks at the market's current risk-reward profile in the context of Friday's late session sell-off and areas of possible resistance. The video also compares similarities and differences between 2011 and 2015. Like the S&P 500, the Dow Jones Industrial Average is near a possible inflection point. 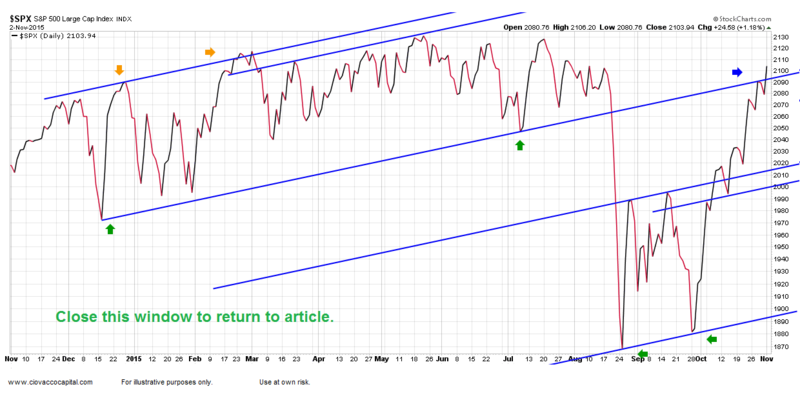 Stock market bears prefer to see the index rejected near the upper downward-sloping blue line. 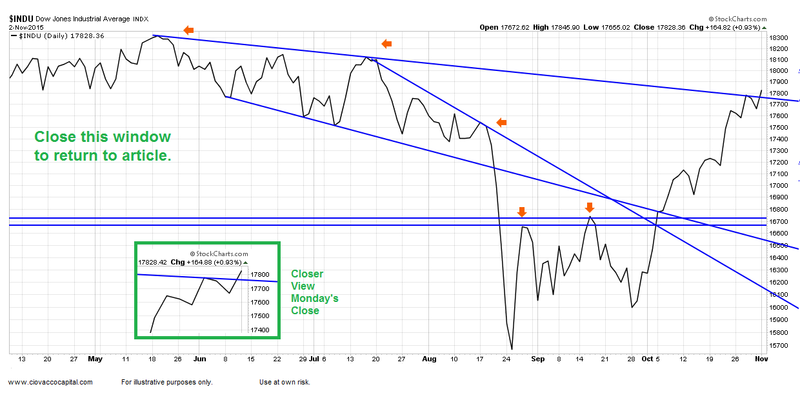 Stock market bulls are pulling for the "breakout" scenario this week. Use this link to see a larger version of the chart below as of Monday's close. Rally on to new highs. Pullback, then rally to new highs. Weakness carries equities to new lows. Based on the facts we have in hand today, the higher probability outcomes appear to be 1 and 2 above. While the new low scenario's probability is not zero, the weight of the evidence tracked by our market model favors bullish outcomes looking out several weeks/months. The previous sentences are subject to change if the data begins to deteriorate; something that has not happened yet in a meaningful way.